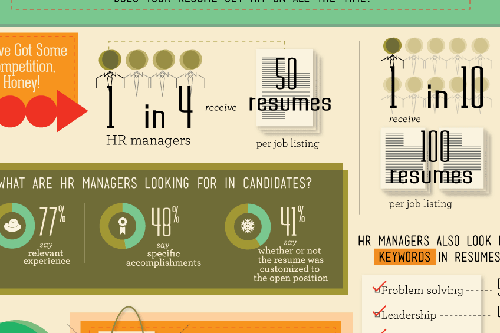 Top Counseling Schools wanted to take a look at the anatomy of a great resume. This infographic is the result of our research. You've Got Some Competition, Honey! Writing a great resume does not mean you should follow all the rules you hear. Every resume is a one-of-a-kind marketing communication. It should be appropriate to your situation and do exactly what you want it to do. --- A good summary can be used as the basis for this interviewer favorite: "Tell me about yourself"
--- This is not the time for humility! Do NOT rely of spellcheck. ?-see? "Career break in 1999 to renovate my horse"
"Service for old man to check they are still alive or not." "Job involved ... counselling clientele on accidental insurance policies available"
"2001 summer Voluntary work for taking care of the elderly and vegetable people"
"I'm intrested to here more about that. I'm working today in a furniture factory as a drawer"
"I am about to enrol on a Business and Finance Degree with the Open University. I feel that this qualification will prove detrimental to me for future success." "I belive that weakness is the first level of strength, given the right attitude and driving force. My school advised me to fix my punctuality ..."